© 2016 Racing Information Services Australia and others working with it. These Racing Materials are reproduced under a copyright licence from the copyright owners. Any unauthorised reproduction, adaptation or communication is strictly prohibited. What is G1 Goldmine Stallion Match? 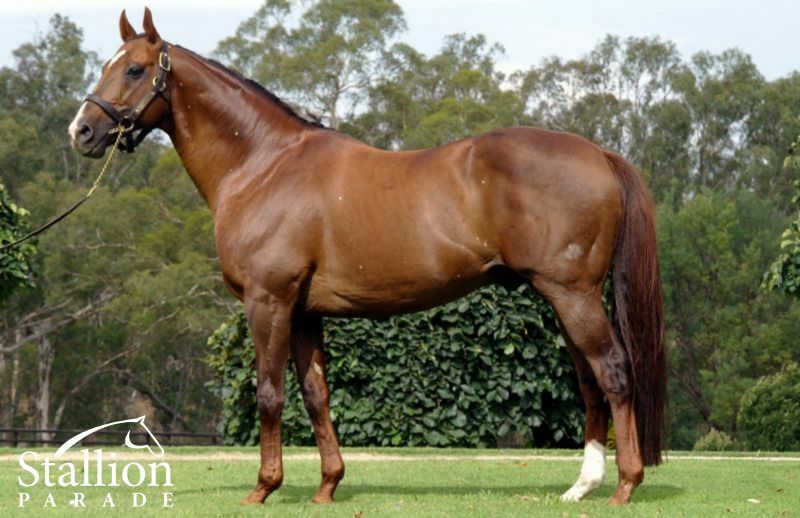 HUSSONET (USA) (Chestnut 1991-Stud 1994). 2 wins at 2, 3d Aqueduct Count Fleet S., L. Champion Aust. Sire (AEI) 2007-08. Sire of 1058 rnrs, 820 wnrs, 98 SW, inc. Hush Money (Valparaiso Gran Premio El Derby, Gr.1), Weekend Hussler, Wild Spirit, Printemps, Trotamondo, Husson, Penamacor, Host, Desert Fight, National Park, Lhiz, El Cumbres, Mar de Kara, Franbulo, Pecoiquen, Mail Coach, La Chiflota, Domaine, Contentment, River Cafe, Marzuk, etc. HOST (c by Hussonet (USA)) 10 wins. See below. Welfeboro (c by Hussonet (USA)) 10 wins from 1000m to 1800m in Chile. Zaitzev (c by Malibu Moon) 6 wins to 1400m in Peru. Decanter (c by Hussonet (USA)) 3 wins at 1200m, 1300m in Chile. Sire. Addie (f by Merchant of Venice) Winner at 1200m in Chile. Fear. 11 wins to 6½f, US$288,793, to 2018, Belmont Allowance. Gin. 6 wins-1 at 2-at 1000m, 1100m to 2018-19 in Chile. Analogy. 4 wins-1 at 2-at 1m in U.S.A.
Della Barba (c Della Francesca) 2 wins-1 at 2-at 1300m, 1800m in Chile and Saudi Arabia, Hipodromo Chile Premio Uroz, 2d Hipodromo Chile Clasico Tanteo de Potrillos, Gr.1, Meydan Al Bastakiya S., L, 3d UAE Two Thousand Guineas, Gr.3. Faluko. Winner at 2 in Chile, 2d Club Hipico Clasico Club de Polo y Equitacion San Cristobal, 3d Club Hipico Clasico Cámara Chilena de la Construcción. Facundo Fa. Winner at 1000m in Chile. El Sunami. Winner at 1300m in Chile. Sacachispas. 7 wins to 1200m in Chile. DUCA DI MANTOVA (c Kazaroun) 3 wins in Chile, Club Hipico Clasico Raimundo Valdes Cuevas, Gr.3. Sire. COLONNA TRAIANA (f Roy) 8 wins. See above. Maderley (f Jeune Homme) 2 wins-1 at 2-at 1100m in Chile, 2d Club Hipico Clasico Julio Subercaseaux Browne, Gr.3, 3d Club Hipico Clasico Arturo Lyon Pena, Gr.1, Clasico Criadores Dorama, Gr.2. Lucky Day (c Kazaroun) 10 wins in Chile, 3d Club Hipico Clasico Paddock Stakes, Gr.3, Clasico Raul Ovalle Ugarte, L, Clasico Luis Subercaseaux E, L.
PIMM'S (c Tumblebrutus) 7 wins-3 at 2-from 1300m to 2000m in Chile, Club Hipico Clasico Otoño, Gr.2, Clasico Diario El Mercurio, L, Clasico Luis Aldunate Carrera, L, Hipodromo Chile Clasico Gregorio Amunategui Jordan, Club Hipico Clasico Barrio Chino, Premio Esplin II, Clasico Archi, 2d Valparaiso Clasico El Derby, Gr.1, Club Hipico Clasico Club Hipico de Santiago, Gr.1, Gran Clasico Coronacion, Gr.2, Hipodromo Chile Clasico Guillermo del Pedregal Herrera, L, 3d Club Hipico Clasico Cotejo de Potrillos, Gr.3, 4th Club Hipico Clasico La Copa, Gr.3. SHOW ME THE MONEY (f Tumblebrutus) 2 wins at 2 in Chile, Club Hipico Clasico Cotejo de Potrancas, Gr.3, Premio Rosebud, 2d Club Hipico Clasico Arturo Lyon Pena, Gr.1, Clasico Julio Subercaseaux Browne, Gr.3. Race Record: 28 Starts 10-4-5 US$842,019, 35,362,500C$, 920,000Dhs. HOST is the 3 time Group 1 winning son of Champion sire HUSSONET. 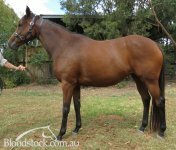 He is a great out cross for Danehill and works well with most sire lines. 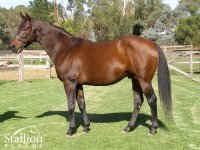 He is priced at outstanding value to breeder this season at $4,400 inc GST for such a solid sire. Please call to enquire for more details or to discuss mating your mare.